Launched at the Winter NAMM show in January 2008, the latest Gretsch Electromatic model is a seriously eye-catching signature model. 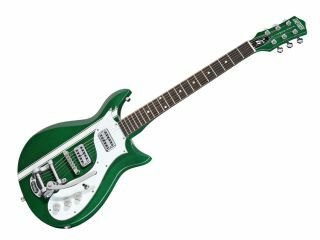 Designed in conjunction with G. Love & Special Sauce frontman Garrett Dutton, the G5135 G. Love signature Corvette comes loaded with a pair of TV Jones Power´Tron pickups and a ‘Phili-Green´ colour scheme and competition stripe. The G. Love Corvette retails at £779.99 in the UK, with a deluxe hard-shell case available as an optional extra. Click here to read the MusicRadar review of the standard Electromatic Corvette model, or visit the official Gretsch website for more information.